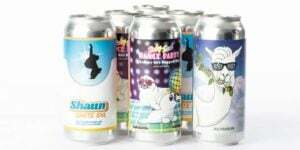 Chicago’s 5 Rabbit Brewery has been making lots of headlines since its inception in 2011. The company secured former Goose Island suds guru John J. Hall as its new brewmaster. It finagled its way into Chicago-area Chipotle restaurants. It opened a cool new brewery last year in Chicago’s Bedford Park, a 25,000 sq-ft facility, about one mile southwest of Midway Airport. Now, 5 Rabbit is making headlines again, but this time not for its Latin-inspired craft beer selection. According to a Crain’s Chicago Business report, the founding partners of 5 Rabbit Brewery are feuding. Andres Araya filed a lawsuit (which you can read here) against Isaac Showaki, claiming Showaki of a smear campaign against Araya, which includes claims of embezzlement and an affair (ouch). Araya is seeking damages in excess of $100,000 in addition to punitive damages. Let’s hope these two can work it out, because this is getting ugly quickly.